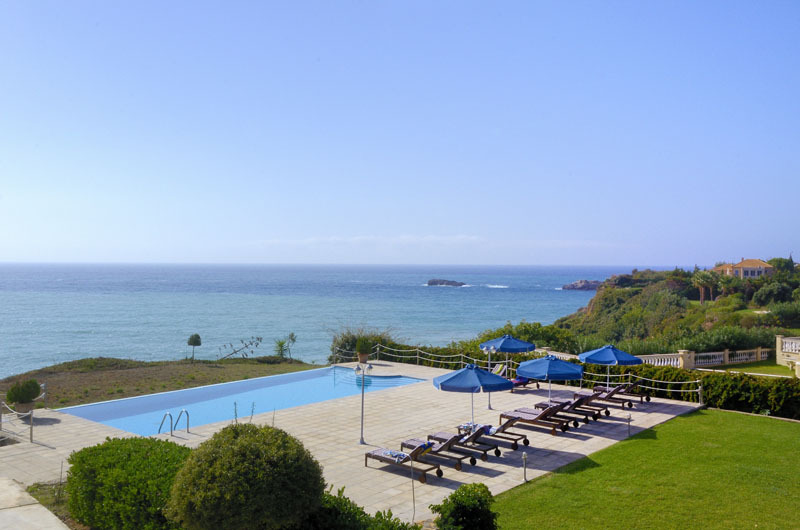 A detached villa in lawned gardens with superb sea and island views overlooking Ai Heli beach, near Argostoli. The southeast coast of Kefalonia from Argostoli to Skala has beaches to suit everyone, there’s even a choice of colours in the sands red, black, white or yellow! Many also have the coveted Blue Flag – hardly surprising as the Ionian Islands have some of the clearest seas in the Mediterranean. Lassi, near Argostoli is a perennial favourite with every amenity both on and off the water of a popular resort, but others such as Avathi a few minutes’ drive from the villas are much quieter and more intimate. 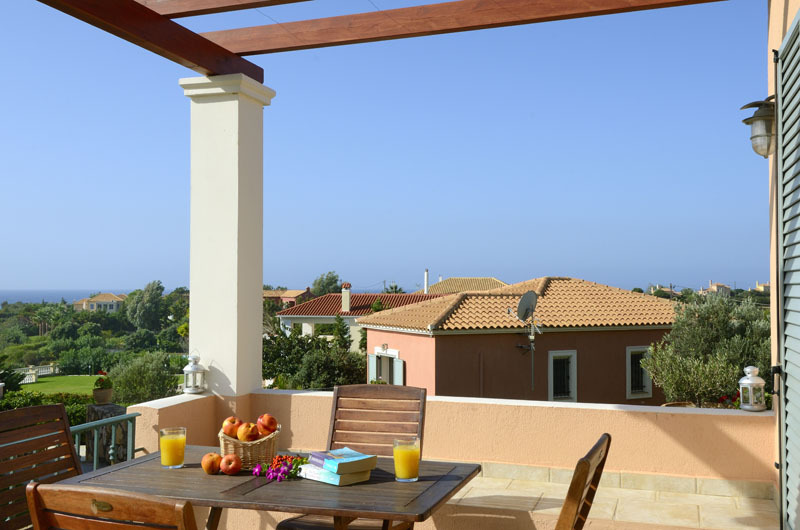 This comfortable detached villa couldn’t be much closer to Ai Heli beach – 84 steps down from a gateway at the end of the lawn beside the infinity pool! The views from the raised terrace in front of the villa are outstanding across to Zakynthos beyond the offshore rock of Dias and its tiny chapel. Argostoli, the thriving capital of Kefalonia is within easy driving distance. Pedestrianized central shopping areas offer a wide selection of shops, pavement cafés and supermarkets whilst the bustling waterfront lined with colourful stalls selling fresh fruit and vegetables is also where the fishing boats dock, each with its own scales so fish for the essential al fresco dining doesn’t come much fresher than this! Svoronata village is only 2 kms away, but there is a minimarket and taverna a mere 200 metres away. As a change from sea and sand the nearby valleys and hills below the impressive Mt Ainos contain not only the finest vineyards in Kefalonia, but the Venetian fortress of St George. 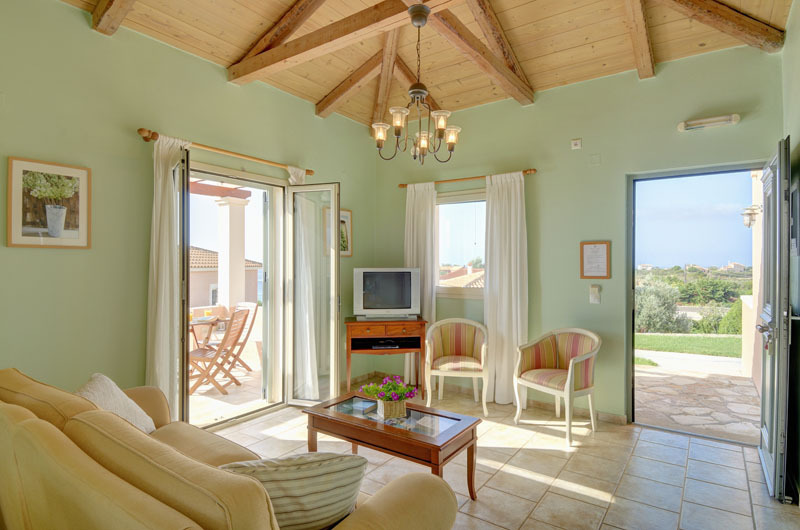 Comfortable with stunning views and personally supervised by Zoe whose hospitality is legendary, Villa Spring is a perfect villa for any season.